In the Tasman Sea, where muscular westerlies blowing unimpeded across the Southern Ocean pile up towering waves and ride the vortex of savage storms, yachts are swallowed with disturbing regularity, in winter especially. The 1,200 miles of sea between New Zealand and Australia known as “the ditch” — the Tasman Sea — is a nasty shrew at May’s end, when three months of winter descends on these parts. 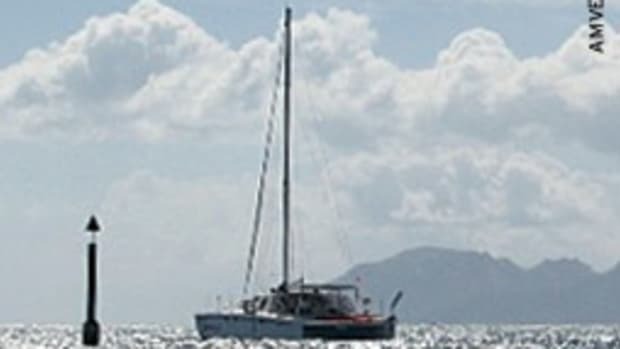 “The Tasman Sea is shooting gales out like a machine gun, living up to its reputation,” wrote David A. Dyche III, owner and captain for 25 years of the staysail schooner Niña, in a May 2013 entry on Facebook. He was aiming for a May 29 start from Opua on New Zealand’s North Island, bound for Newcastle, Australia, 1,500 miles away. “We are shooting at leaving out after the first [gale] this week. No doubt we will be dancing with one or two of them,” he said. It was a prophetic statement. The 85-year-old Niña, a fabled 50-foot (LWL) ocean racer that once was the flagship of the New York Yacht Club, disappeared without a trace, along with Dyche and his wife, 17-year-old son and four crewmembers during what should have been an eight- to 10-day crossing. 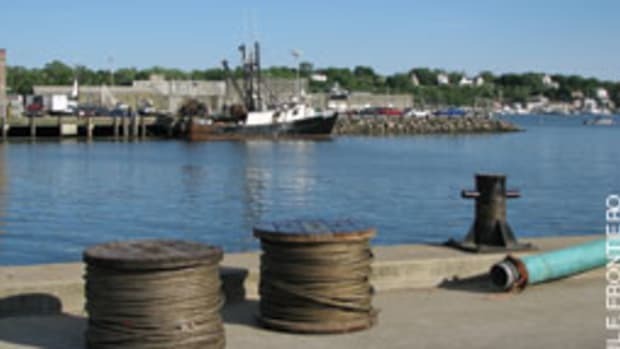 He was a commercial mariner and diver who worked 90 days on, 90 days off as a captain, typically on 200-foot ships that set anchors and worked supply for oil rigs. 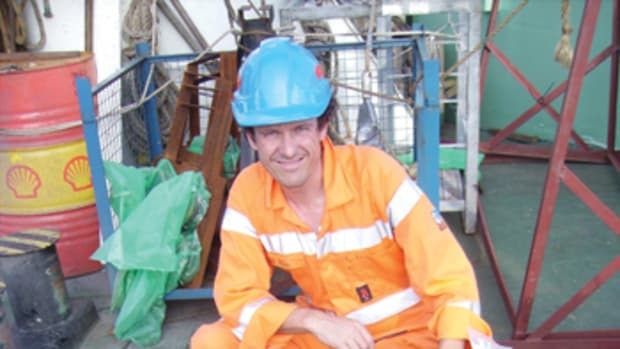 The Rescue Coordination Centre New Zealand judged him an “experienced skipper” capable of sailing Niña under adverse conditions. Equipped with a new 150-hp Cummins diesel, Niña set out from Opua on May 29 with Dyche, 58; his 60-year-old wife, Rosemary; their son David, 17, who was to leave the boat in Australia to go away to college in the United States; Kyle Jackson, 27; Evi Nemeth, 73, a retired University of Colorado professor, author and international authority on computer systems administration; Danielle Wright, 18; and British crewman Matthew Wootton, 35. 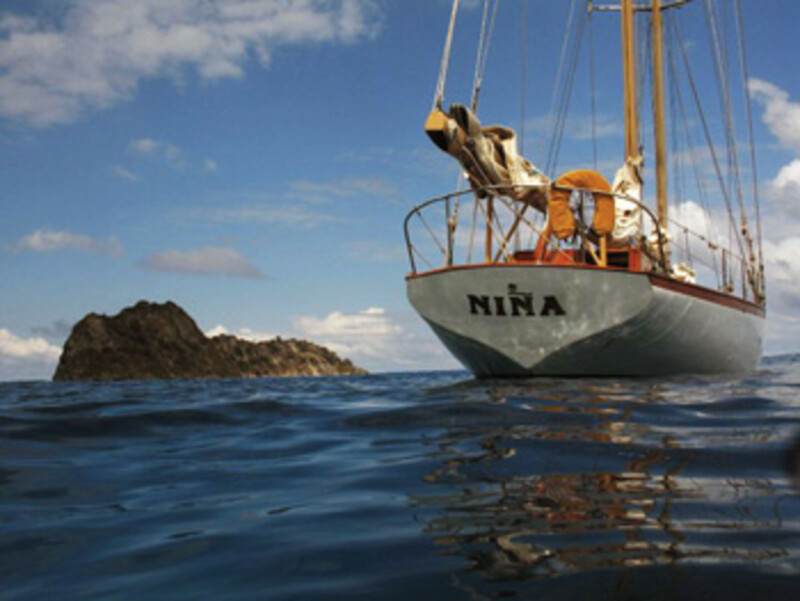 Niña was last heard from June 4, 370 miles west-northwest of Cape Reinga on the northwestern-most tip of North Island. 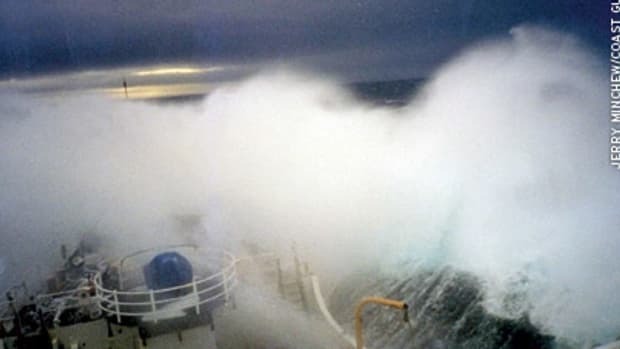 The RCCNZ reported 26-foot seas and 50-mph winds gusting to 70 in the vicinity as one of a string of brutal winter lows marched through the Tasman Sea in early June. Communications from the vessel were erratic. At around 11:50 p.m. on June 3, Bob McDavitt, a New Zealand meteorologist and router for Pacific cruisers, received a satellite-phone call from Niña. 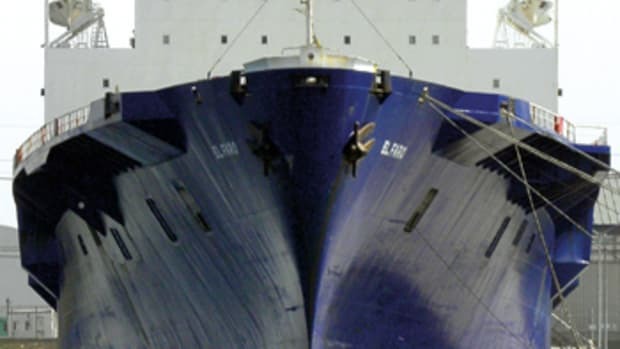 Nemeth, a veteran skipper who had sailed her 40-foot sailboat Wonderland across the Pacific to New Zealand, said the weather had turned nasty and asked where Niña should go to escape the storm. McDavitt told reporters he asked her to call back in 30 minutes so he could prepare a forecast. The next day, June 4, McDavitt fielded a text message from Niña: “Any update 4 Niña? Evi.” He advised the crew to ride out the storm where they were for another day. He then texted Niña daily for several days but didn’t hear back. RCCNZ also noted that the yacht was carrying a manually activated EPIRB, a SPOT beacon (also manually activated), a satellite phone, parachute flares and a VHF radio — none of which were used, which authorities said strongly suggests that Niña sank quickly before the crew could react. It wasn’t until June 12, at the urging of friends and family who reported the vessel overdue, that the search for Niña began. The search-and-rescue coordination center suspended its search July 6 after overflying 737,000 nautical miles of ocean and North Island shoreline where it hoped to find survivors or debris. It was one of the most exhaustive searches ever for RCCNZ. Searchers flying a Royal New Zealand Air Force P3 Orion, helicopters and commercial fixed-wing aircraft found “no sign of vessel or crew,” said RCCNZ operations manager John Seward. Nothing — no bodies, no life rafts, no wood or sails or cushions or life jackets, no debris at all. This seemed peculiar to the families of the missing crew, who surmised that if there was no debris in the water, Niña must still be afloat and if she still was afloat that her crew likely were alive. Perhaps Niña had become caught up in one of the “reverse-circulating, counterclockwise currents” — gyres that spin north and west off the East Australia current — and was riding a continuous loop, as disabled vessels sometimes do before being spit out on a beach in southeastern Australia. The parents of Danielle Wright undertook a three-month, $600,000 private air search, much of it funded with their own money. Ricky Wright, Danielle’s father, even earned a pilot’s license to keep the search alive. After abandoning it, Danielle’s mother, Robin, said they still weren’t convinced Niña had gone down. 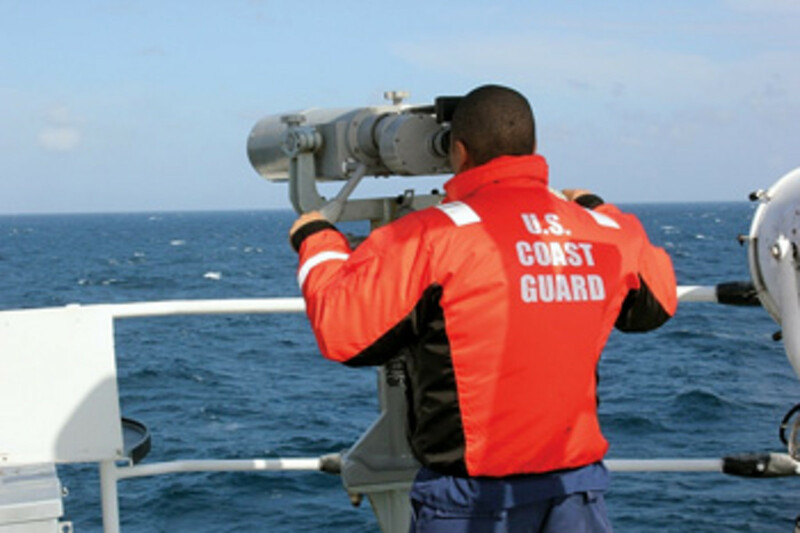 Meanwhile, Niña advocates petitioned the U.S. government to task the National Geospatial Intelligence Agency to acquire and analyze satellite imagery of the Tasman Sea to look for a small boat or life raft, and to ask that the Coast Guard allow Texas EquuSearch — a volunteer group that employs the best technology available to search for missing persons — to use the agency’s drift-modeling software to continue the search. The requests were declined. DigitalGlobe, a Longmont, Colorado, provider of earth imagery sourced from five satellites, agreed to provide imagery of the waters where Niña might be for “crowdsourcing” — analysis of the images by 13,000 volunteers. Niña and her crew remain missing. Built by Ruben Bigelow in 1928 on Cape Cod, Massachusetts, Niña was designed by Starling Burgess to win the 1928 Queen of Spain’s Cup, a 3,900-mile trans-Atlantic race from New York to Santander, Spain, which she did handily in 24 days. She went on to win the 1928 Fastnet — the first American yacht to take home that trophy — after a 600-mile sprint through the stormy English Channel and Irish Sea. In 1934, New York banker DeCoursey Fales acquired her. Fales became New York Yacht Club commodore in 1949, and Niña became the club’s flagship for three years. In the polar region of North America, the story of the SS Baychimo — ghost ship of the Arctic — conjures thoughts of a dogged trader with a soul that just wouldn’t die. The coal-fired steamer was built in 1914 in Sweden for a German shipper that ran her between Hamburg and Sweden. Named Ångermanelfve, the 230-foot cargo ship wound up in England after World War I as reparation for its maritime losses during the war. Hudson’s Bay Co. bought her in 1921 for its trade in pelts with Inuit settlements along Alaska’s north slope and Canada’s Victoria Island. She was renamed her Baychimo. Based in Ardrossan, Scotland, each summer Baychimo would steam up the Chukchi Sea to Point Barrow and east on the Beaufort Sea to Victoria Island and King William Island, stopping at trading posts along the way to exchange guns and ammunition, tobacco, tea, sugar, cloth, tools and other basic necessities for furs. 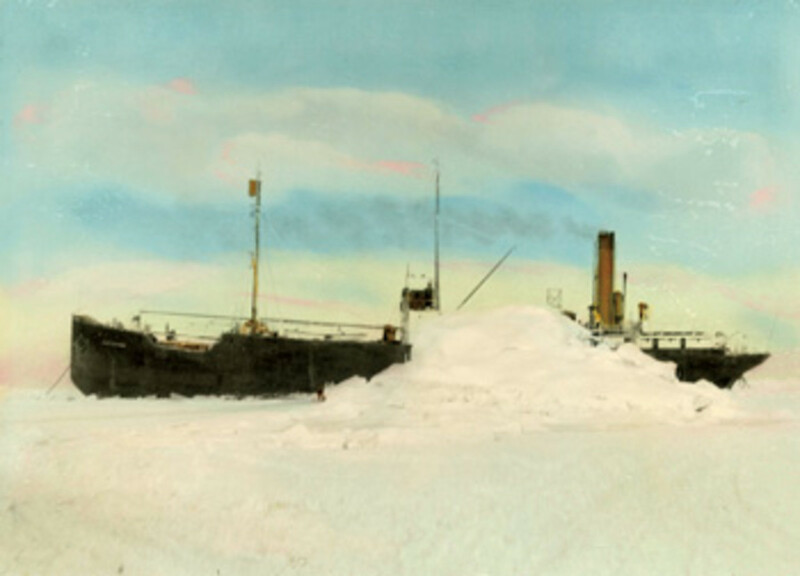 Baychimo made nine of these voyages, pressing forward through the short Arctic summer in “fierce gales, dense fog, rough seas and — especially — treacherous ice,” writes Anthony Dalton in his book, Baychimo: Arctic Ghost Ship. 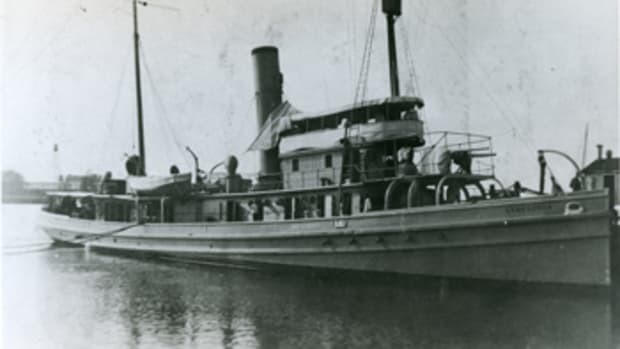 Baychimo, her triple-expansion steam engine pushing her to 10 knots, circumnavigated the globe in 1924 and attempted an east-west crossing of the Northwest Passage, a voyage that was cut short when she lost a prop in the ice. She was an intrepid voyager, but her luck ran out in October 1931. The Arctic winter settled in early, preventing her from reaching Cambridge Bay on Victoria Island and Gjoa Haven on King William Island. The crew turned around at Coppermine on Coronation Gulf and made their way back to just south of Point Barrow, Alaska, where Baychimo was trapped in pack ice, writes Arctic historian Kenn Harper in a column in the Nunatsiaq News. The crew left the ship, trekking a half-mile to Barrow for two days’ shelter. Returning, they found Baychimo had broken free of the ice, but a week later she became stuck again — this time for the winter, or so her captain thought. He “sent a wireless message for an aircraft to take out most of his men,” Harper writes. “The remaining crew built huts on the beach. Baychimo was only a half-mile offshore. Their plan was to remain near the ship and sail her out the following summer. A few days later Innuit seal hunters brought news that they had seen Baychimo 45 miles south and 15 miles offshore, so the vessel’s captain, Sydney Cornwell, set off by dog sled with his crew to find her. She was sitting with a slight list on the ice, still intact. They took off supplies in two trips, but when they came back a third time she had disappeared again. Believing Baychimo finally had sunk, Cornwell and his men flew out. Over the next 38 years, Baychimo was sighted no less than 10 times: in 1931, 300 miles southeast of Barrow; March 1932, by one Leslie Melvin, en route to Nome on a dog sled; a few months later, by a group of prospectors; August 1932, by a trading party off Wainright, Alaska; March 1933, by Innuits who found shelter aboard her for 10 days during a storm; July 1934, by explorers; September 1935, off Alaska’s northwest coast; November 1939, by a Capt. 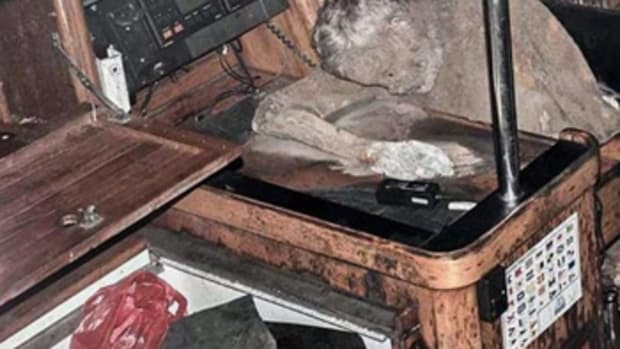 Hugh Polson, who intended to salvage her, but ice floes prevented it; a number of times after 1939 until March 1962, when another party of Innuit saw her adrift in the Beaufort Sea; and finally in 1969, when she was found frozen in pack ice — her last recorded sighting. Dalton suggests Baychimo appeared and disappeared while drifting on ocean currents and in winds associated with a large gyre in the Beaufort and northern Chukchi seas, which carried her as if on a conveyor belt — in circles — out to sea, back close to shore, out to sea again.